Silca's nickel-plated brass Thread-On Schrader Chuck has been manufactured by the same supplier for over 25 years and will probably last even longer. The chuck attaches to any Silca hose with a hose barb on one end and female Schrader threads on the other. 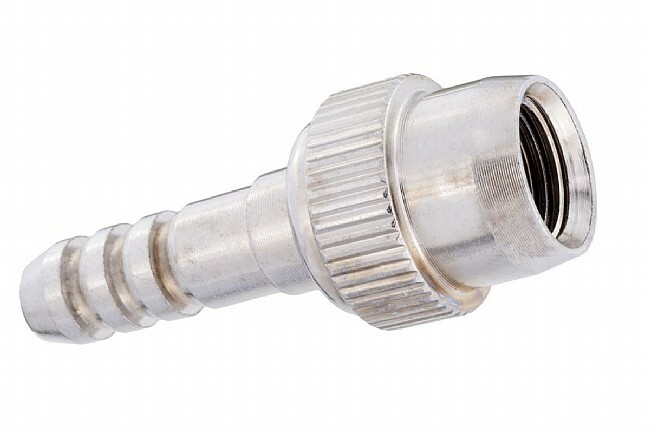 The chuck threads onto a Schrader valve or Silca's Stainless Presta chuck or CP1 Disc Adapter. Nickel-plated brass construction. Hose barb fits all Silca hoses, old and new. Threads to Schrader valves and all Silca chucks with male Schrader threads.